I’m appealing to the search engines with the title of my post today, because this is what I was hoping to find when I turned to Google for help with my FreeStyle Libre a few weeks back. I was about halfway into a sensor that I had purchased, when suddenly my reader stopped working. The screen wouldn’t start up when I hit the home button. There had been a few instances in the days leading up to this where my screen had blacked out for five or ten minutes at a time, but it always came back to life. I might also mention that this culminated on a Saturday morning, and I soon learned that I wouldn’t have access to customer service until 8am on the Monday. When my reader still wasn’t responding well after an hour, I was frustrated. I reached out to @FreeStyleDiabet on Twitter with no reply (I’m not too sure where in the world this account is based). I tried charging the battery with no success. I got an idea from the instruction manual that the device might be temperature sensitive, and kept it in my pocket while I was sleeping one night with no luck either. I had no idea where I would stand in getting replacements for my reader and the $95 sensor I couldn’t make use of. Abbott were a little coy at the blogger event in Sydney regarding faulty sensors, and we were told that it would depend on individual circumstances. When I got in touch with Customer Service on the Monday, they shipped me a new reader and replacement sensor on the condition that I send the faulty one back via supplied packaging. The replacements arrived via express delivery two days later, and I started the sensor up once again. I gave customer service a call once again, explaining my problem. I was reminded to factor in the 5-10 minute lag time, which I was confident I had. I was then asked to provide three Libre readings and their respective finger stick readings, and I was put on hold to do a control test. The customer service rep then came back and told me that he would send me a replacement sensor free of charge because I was reporting readings higher than the acceptable difference of 1-2mmol. I was really impressed at how quickly I was issued with a replacement sensor over the phone. I had meter reports prepared prior to calling, almost expecting that I would have to send through evidence of inaccurate readings. Both times, my replacement products were shipped by overnight express to my doorstep instead of the usual 6-9 day delivery window. However, I would have expected customer service available to me on weekends, even if just for a couple of hours. I also think that Abbott need to be more realistic about their products developing faults. The returns policy, which you can read here, is rather brief and doesn’t give the customer a feeling of confidence or support when the tech fails. That being said, I am super grateful that Abbott resolved both of my problems with very minimal hassles. Medtronic have a 24 hour , 7 days per week, customer service, full express replacement within 24hours, no questions asked and the cgm has good bgl reliability and is cheaper then the Free Style Libra. I guess my only disappointment with this whole Freestyle Libra was the build up to an “affordable” way to monitor via scanning. I have never used it so i cannot comment on it’s reliability rate but you can asked the company for the data they must hold on it’s reliability rating and who did the research. I had some concerns and Medtronic immediately took affirmative action and have found them to be highly professional. I agree Frank. I try to only do business with companies with a 24 / 7 customer support service. Thanks for your blogs and posts about Diabetes, Frank. I’ve been using FreeStyle Libre from 4 months now. I faced many problems with sensors, but also with readers. Three readers up to now have died after an error message like you describe here. I’m getting crazy with the readers. After these three died, i’m starting to think that the charger provided by FreeStyle within the reader box doesn’t provide the right current for the reader and this sooner or later crashes. I had to call FreeStyle support all that times and ask for a replacement. No problem on that, support is quite good when these problems happen. Thanks for reading. Ive also heard that the reader can be temperature sensitive if you’re in an extreme climate. But yes, in my experience customer service have been excellent. Were they able to fix the problem with your reader? Well last months were Winter here in Spain, the last 2 were Spring. But we are having very smooth temperatures here. I think the problem is more related with the power supply. Chargers should be introducing some problems when charging the reader. Maybe some overcurrent 🙁 no idea. The solution with the faulty reader is as the previous ones just to send me a replacement. After sending the faulty one back to the company, I don’t know how they fix it. I used this a year or 2 back (buying it at an apparently considerably lower price that other alternatives), hoping /expecting (stupidly) it would change, or at least improve my miserably paranoid diabetic life… but alas, this is the WORST item I have ever wasted my time over. I have changed the reader 3 times due to just “not working” I dont know how many sensors have passed my way both in warantee or purchased. I have never reached 2 weeks on them. I think at best, 8 or 9 days, and that was only when i was pretty much vacuum packed and certain to not touch a shower, nor sweat nor contact anything that could detach it. However usually really 5 days is a more realistic number. Despite the BS indicated you certainly cannot swim at any depth, have a shower or even brush against hedges (yes not a joke) without it giving out signals or detaching. My levels continunally provide differences of 70-100 so this is not reliable. For some reason on my national health plan in Europe it has finally been accepted – ie. I get 2 free a month. I really thought they’d got it working finally. Now I know these are free, but honestly, the same problems are existing, after literally 24 hrs, applied correctly, no showering, no rugby playing, but just being calm, the same results, it detached slightly and giving very erratic results compared to the normal blood strip tests. twice this has happened. I would really advise against this to anyone who considers this item the low cost of the sensors that dont work and leave you very neurotic during the day is quite easily offset by sensors that cost a bit more but actually work. I actually had medical professionals applying a sensor to me, just in case I was doing something wrong. I have no idea how on earth a health system has permitted these things to enter into the market, I thought they had to pass certain tests….? Sorry to hear your experience with the Libre hasn’t been a great one. The feedback I’ve gauged from the diabetes community here in Australia is divided. Some people love it, while others say it’s not accurate. Everyone is different, I suppose. Thanks for your comment. I’m in Australia too and I’ve been using them for almost a year- I love it even though I’ve had my fair share of faults and issues! Customer servce have always provided replacements and as I lead a very active life-style it is a real life saver! I also swim every day with it (plus I exercise and sweat A LOT) so I’m surprised to hear previous person (Jon) could not even shower with it! How frustrating! Your lucky to get such good support. Out of 7 sensors 3 have failed. The latest lasted 1 day. I complained about the previous 2 failures. I filled out the online feedback as requested and of course heard nothing back. I think next stop is consumer affairs. Yes, we have the same problem with our Daughter’s Libre at the moment. The reader is telling her “connect to computer” and won’t read. She can always take her blood sugar with a stick and her old meter but we told her she would get rid of the needle sticks if she decided to keep going with it. I am not sure that she will since we don’t trust it enough yet. I have the same problem today.. Did you solve it? I have been using Libre for about two years and like others who have posted here, I have had many problems with defective readers and sensors. It is correct that Abbott will send out replacements quickly from a Sydney warehouse. But, I have had nothing but drama dealing with their call centre, who I think are based in Manilla. Maybe it is a cultural thing but you cannot simply state your problem and move on. Nearly every call takes an interminable period of time. They needlessly repeat back what you have said and ask for affirmation over and over. I suspect that they have a tick a box form that they are pressured to get right and are being monitored. For a product that has the same ongoing issues why can’t we just be able to lodge notice of a defect online? Thanks for this blog it has generated a lot of interesting comments. I’ve been using libre with blucon night rider of a couple of months. Of 4 sensors 3 have failed at 4 days 9 days and 2 days. First they start reporting really low numbers like 2.4 when a blood test reveals 10.5. Up to 8 off! I agree with the support they go through a checklist of tests then send out a replacement, they are very guarded on questions about how often sensors are failing. The good news is that replacements come express usually 1-2 days only. At first I was worried that the blucon device was killing the sensors but after reading here I suspect its just that these things really are likely to fail often which is why they do not seemed surprised and quickly agree to send a replacement. 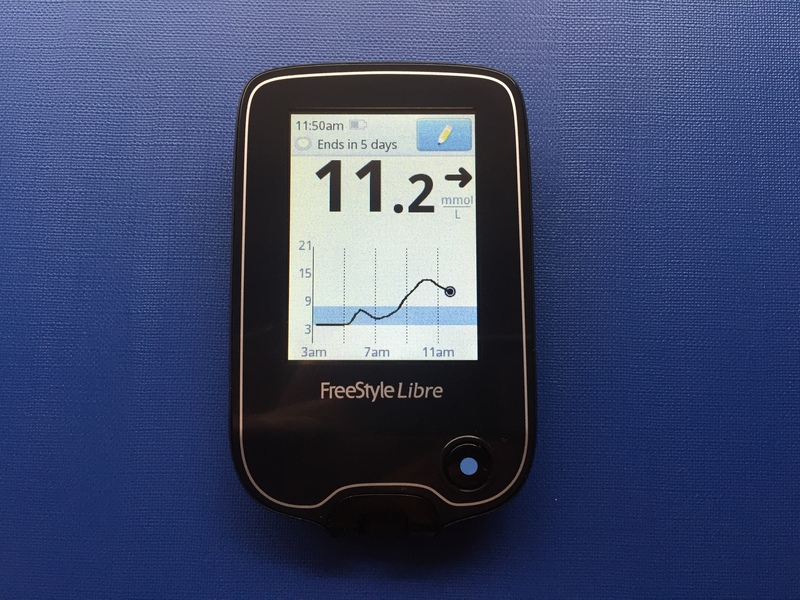 It will be great when the libre sensors quality improves (it can’t get worse) and when they finally get on to the ndss subsidy list in Australia …. Sound of political can being kicked down the road. Sally71 mentions that the libre doesn’t read blood. This is incorrect. It does read blood which has been transported to the interstitial fluid. The only difference is, there isn’t so much blood to read as with a finger prick test and also the blood flowing to the interstitial fluid is delayed compared to actual blood underneath the skin. For this reason even though the blood has been delayed, the accuracy of the Libre should be as good as a finger prick test. What this means of course is that the basic underlying principle of the system is good and the flaws should be ironed out as time passes. I.E As Abbot improves their system with more testing and research. So the people who are having a bad experience at the moment , please don’t give up hope. This product is the worse. Abbott knows this product is faulty. I’ve had 3 sensors in the last 2 weeks n the reader has not read one yet. How much longer before a recall on this product and fix the problem. I am so frustrated right now and out of a lot of money. Calling again tomorrow. Still finger sticking. I don’t trust the system since readings have been much higher or much lower than finger pricks checking blood since I have been using system. I was on my third reader and gave up. It was a great idea that didn’t work for me. I am type 2 diabetic. Thanks to all these comments I don’t feel alone in my woes! I have had a horrible time with Abbott and Bayshore. Their customer service is terrible – infrequent, as mentioned, they take a long time to respond to my emails (I received a reply to an email from LAST YEAR a few weeks ago), call waits last a long time, their staff are not equipped to answer questions helpfully, and they do not store my personal information correctly. I attempted last year to order a Libre and months later received an email saying they cancelled my order because my insurance provider could not cover it, even though I paid out of pocket. I was prescribed a libre by my endo a month ago. They issued me one sensor and reader for free. They injected the sensor and I went home and waited the hour for it to calibrate. It continued to provide errors, making me wait an hour in between each check. I was issued a new sensor a few days later. Then after a week, the reader stopped working. It was not exposed to any different conditions, yet it just refused to turn on after I had already used it 3 times that day without issue. My endo really wants to see the continuous data so I decided to splurge and purchased the 2 sensor/1 reader package last week. After my original confirmation email, I have received no further news of my order, despite the email saying the order would arrive in 2-3 days. I have not even been billed for the order yet. My next plan is to get a short spiky hair cut and do some shopping at Reitmans to see if that will help them understand my frustrations as a customer.